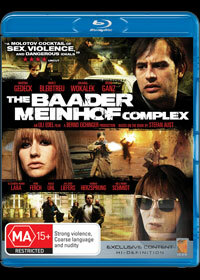 Set in Germany during the 1970's, the Baader Meinhof Complex involves a group of deadly terrorist attacks led by the children of former Nazi’s. This group is lead by Andreas Baader (Moritz Bleibtreu), Ulrike Meinhof (Martina Gedeck) and Gudrun Ensslin (Johanna Wokalek) who have vowed a war against American imperialism in their country. The story is about the rise and fall of the Red Army Faction (RAF) and the only man between them and Germany is a police officer named Herold (Bruno Ganz) who is investigating and tracking their crimes which leads to some unusual confrontations. The film is a very dark look at humanity at its worst as these “children” attempt to create anarchy and reform Germany in their own idealisation of Germany’s former glory. With a wonderful screenplay and powerful acting by all involved, director Uli Edel almost transforms this movie into a look at urban warfare and is almost a social commentary of the time. At times, it also parallels the name of the movie as the viewer is also taken on political journey about Baader and Meinhof and the film mimics the original novel by Stefan Aust quite well. Although the violence in the movie is unjustified, it’s a very compelling film that goes beyond just blood and gore and on Blu-ray, it’s truly a cinematic treat. Definitely a must see movie which comes highly recommended!